I was so incredibly honored (okay, and a little bit nervous) when I was asked to give the Saturday keynote at the Illinois School Library Media Association annual conference. These folks put on a really great conference, and I’m so thrilled that I was able to be part of it! 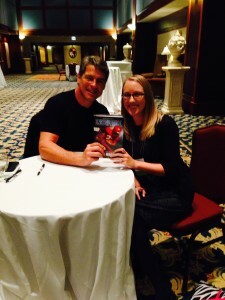 This was my first keynote and is a memory that I know I’ll treasure for the rest of my career. My keynote was “Examining the Sacred Cows of School Librarianship.” I had the chance to talk about many things near and dear to my heart — including a little about genrefication! Other highlights from the conference include meeting Tim Green and Sharon Draper and having the chance to hear them speak! 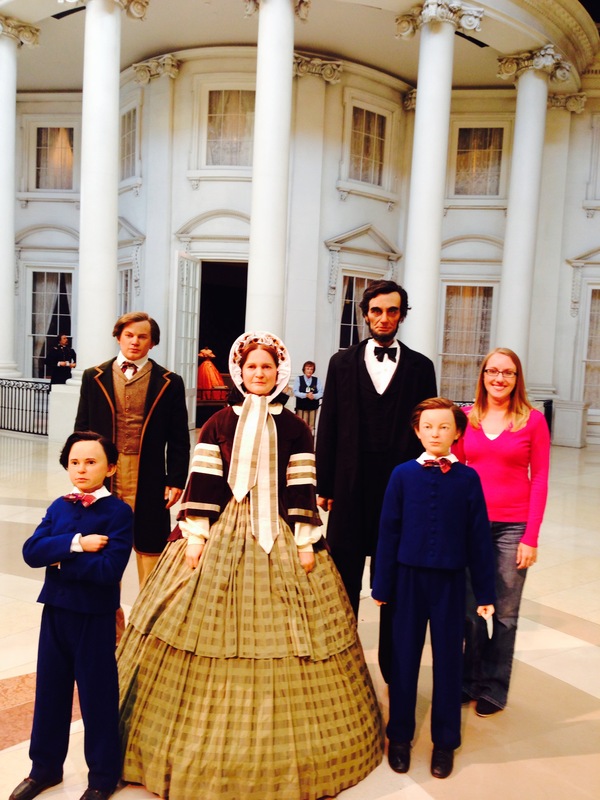 And I made a quick visit to the Abraham Lincoln Presidential Library and Museum, which was amazing! I went home just in time to meet my friends from Cavalier House Books to set up our book fair, which ran from November 4-7. I am so lucky to live near these guys, because they sure do put on an amazing fair! I did my first fair with them this spring, and it was one of the best things I did last year! I’d been looking forward to AASL since the last conference in 2011! Not only did I get to see so many of my amazing library friends, I presented with many of them, too! A Library in Every Pocket: Click the image above to see the wiki full of resources from this pre-conference and abbreviated encore session I presented with Gwyneth Jones, Michelle Luhtala, Shannon Miller, and Brenda Boyer. 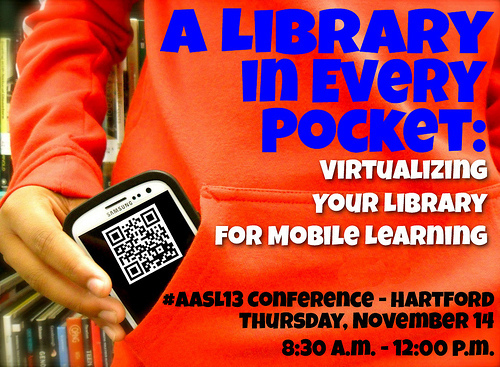 AASL Best Apps: It was very exciting to be part of the committee that put together the 2013 (first ever!) 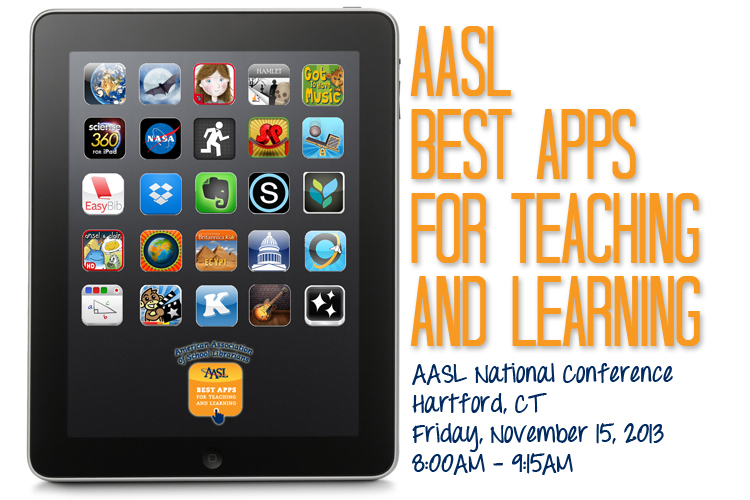 AASL Best Apps for Teaching & Learning list, and at the conference we had lots of fun sharing that list! Click the image above to see the list! Unconference: Even though I knew I was already pushing my limits with all of the presentations I was involved with presenting, when Joyce Valenza asks if you’re interested in helping with ANYTHING, you always say YES! 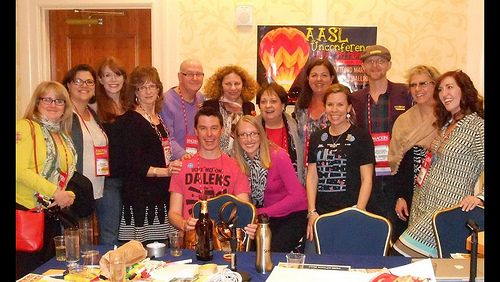 I had a blast helping out at the AASL Unconference. There was such a great turn out, and so many great discussions took place! Ditching Dewey: I had an absolute blast presenting with Shannon Miller, Sherry Gick, Kathy Burnette, and Megan Scott on genrefication! We even got a little shout-out from School Library Journal here! I’m a National Board Certified Teacher! I’ve been anxiously awaiting the results from my National Board portfolio and assessment submissions for MONTHS. I am so excited to have achieved certification in my first year of the process! Even though I don’t think I’ll see any monetary benefits from this from my state or district (I believe they made changes after I started the process that cut off funding for those certifying after July 2013, but I haven’t really researched this since I was already in the process and didn’t want it to impact my motivation), I’m still quite proud of myself for this accomplishment! So, that’s where I’ve been and what I’ve been doing for the past month! I’m so thankful for my friends, family, and amazing PLN that have supported me through all of these exciting things that took place this month. And now, I’m thankful for a break from school and some time to relax! You rock. Seriously. What a month! 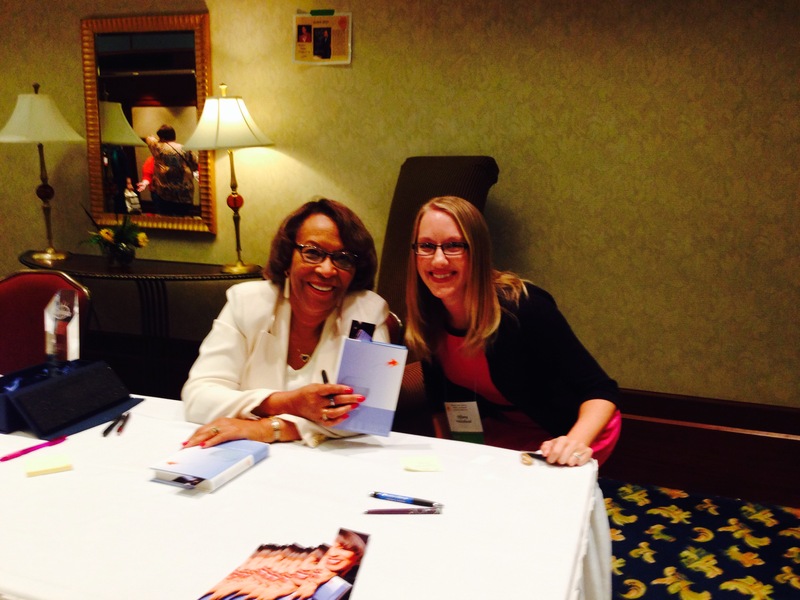 I’m so proud of your accomplishments and how you represent the best of teacher-librarians! What a professionally fulfilling month!! First off, you’re amazing. And secondly, that Ditching Dewey cover is still one of my favorite cover images I’ve seen for a presentation. Can’t say that enough. Probably didn’t hurt that it was presented by such awesome ladies 🙂 Tiff, I’m thankful for you and that I get to know someone so very cool. Never change.